I have really been itching to make a wreath lately. The last wreath I made was my green wreath that I made back in the spring with thrift store finds for $3.00. That wreath has actually been on my front door since then. I still love this wreath so I just moved it to the inside of my front door so I get to enjoy it inside for a while! And bonus – I could cross off making a wreath off my goals list, I am using something I bought thrifting on Saturday, and because I was inspired by some wreaths I saw on Pinterest I can count this as my Pinterest project for this month! Then I cut each individual stem off of the forsythia branches – there were 4-5 little stems on each branch. Then I just started poking them in the wreath all the way around. I don’t usually glue my flowers like this on a grapevine wreath because I can usually wedge them in there pretty good. And it saves time in gluing and when I want to change the wreath up in a few years when the flowers get faded they are easy to just pull out. Now just so you know, I always help when I am crafting and putting together a wreath in the floor. If you can call, grabbing at the stems, trying to eat the flowers, and chasing any ribbon I use help, that is! That’s ok, his cuteness and company are totally worth it. 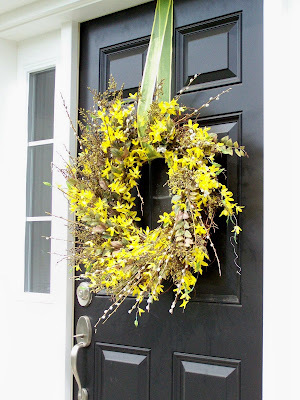 Maybe one day I will find some more forsythia at a yard sale or find some on clearance at Michael’s. But for now, I dug through my flower stash (yes, I have a flower stash too – remember my Hoarder’s craft room??) and found a white dogwood bunch and a white hydrangea bunch. Both of them were bought at Dollar General when they had their home décor 50% off – so I paid $1.50 each. I cut those apart and added them to my wreath. I tied it up with some white ribbon from the dollar store and it was finished! Not bad for some yard sale flowers, some Dollar General flowers, and a Goodwill wreath. Even if you didn’t have the wreath or the ribbon – the ribbon was only $1 from the dollar store and the wreath can be purchased at Michael’s for about $4 (of less if you could find one at Goodwill) so it would have still been under $10 for this project. Here is how it looks from the front yard. And look at that grass –it is actually GREEN – amazing what a little rain can do! I know some people might call this a spring wreath and it very well could be a spring wreath as well. But I wanted something bright, cheery, and yellow for the remaining of summer, and I am loving this on my front door! Have you made any wreaths recently? And would you use this wreath in spring or summer – or both? Love this wreath! So bright and fun! casper looks like he’s doing a great job, lol. my kitty is the same way, they are so silly. i love the forsythia! I have had really good luck finding willow wreath forms at the dollar store (2-3 sizes) for $1 each. They also sell “floral wire” (1 roll is enough for a medium sized wreath) that bends really easily. I used this to attach flowers to the form and made a wreath for under $10 (fake flowers, form, wire, ribbon). Gotta love the dollar store!